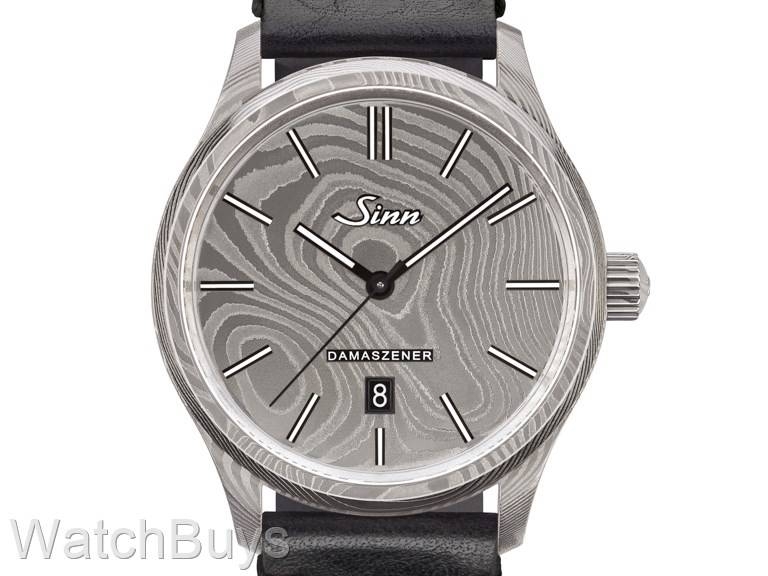 You may recall that several years ago Sinn released its first watch made entirely of Damascus steel which was coated in all black PVD. 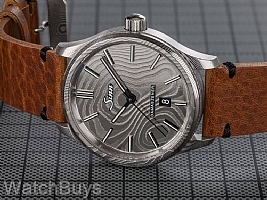 That limited edition quickly sold out, and the day after the PVD model was first shown at BaselWorld Sinn began to receive requests to produce another limited edition watch in Damascus steel but this time leaving the Damascus steel case and dial in its natural steel color and finish, and this is that new watch. 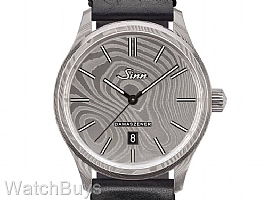 The new Sinn 1800 Damaszener Limited Edition is made from Damascus steel (German: Damaszener Stahl). Many of you may be familiar with this type of steel as it is often used in the production of fine knives and other steel collectibles. 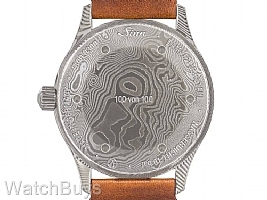 Because of these patterns, each watch can be considered a unique piece as no two will look the same or have the same patterns because of how the two steels are folded together. Damascus steel has fascinated humankind for centuries. It gained its legendary reputation in the production of museum quality swords, knives and blades. Damascus steel is a combination of at least two different types of steel, layered to create the unique surface design. The traditional art of making Damascus steel is very elaborate and portrays a unique blend of craftsmanship and technology. During production, the different types of steel are layered and forge welded together. The piece is then forged, halved while in a glowing state and layered together, over and over. Experts refer to this production technique as "folding". By combining soft and hard steels, a new kind of steel is created, one which displays properties of the two original steels. In the final stages of production, the Damascus pattern is made prominent through surface etching. The steels are dissolved to varying extents by acid, thus forming the typical light and dark patterns which take on different characteristics in different lighting. The use of Damascus steel in the production of watch cases is particularly challenging because of the risks of corrosion. To find a solution to this problem, Sinn adapted recent developments in materials engineering. 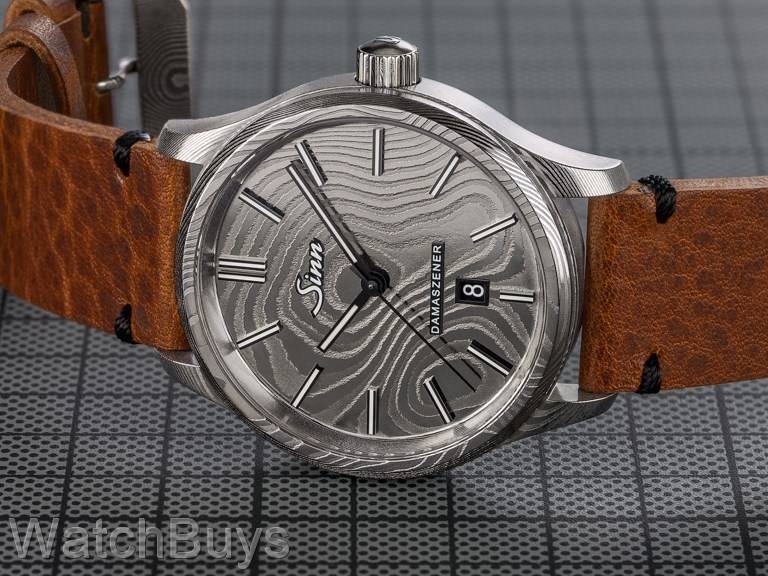 When producing the Sinn 1800 Damaszener Limited Edition watch, two types of high grade stainless steel are used, and these metals are forge-welded together. The production of such high grade compound steels requires the use of the latest and most advanced raw materials, which is evident in the anti-corrosive properties of the finished steels. Sinn's long established partner Balbach Damast guarantees the quality craftsmanship and precision of this watch. The materials specialists at Balbach Damast have continually developed and perfected this forging technique, which is more than 2,000 years old, allowing Sinn to produce the case and dial entirely from one block of Damascus steel without the associated risks of corrosion. To further protect this watch, Sinn completes the case construction with their Tegiment hardening process. The crown and the bow and pin buckle are also manufactured from Damascus steel to create a work of art. 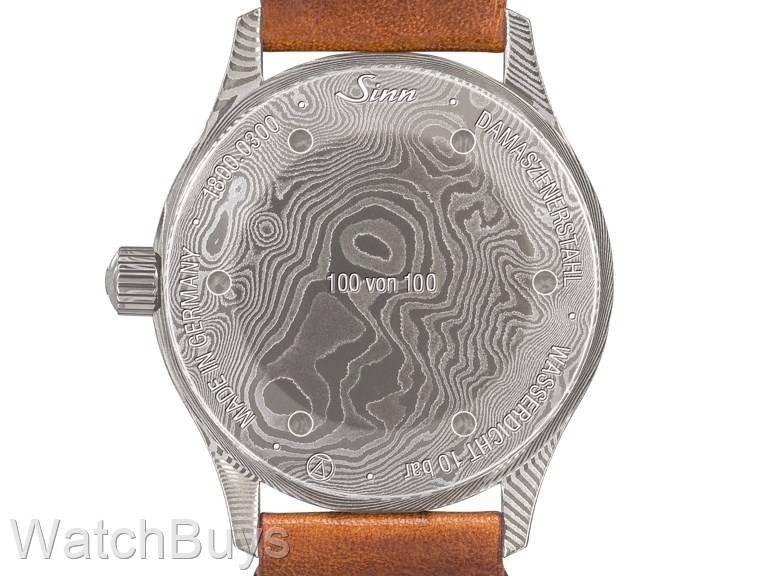 Finally, Sinn employs appliqués to complete the dial in three dimensions with their name and logo. Be sure to click the tab marked Video to see how this case and dial are made in a small village just north of Frankfurt. This watch features elaborate packaging with tools. After opening the Sinn black wooden box, you'll find two Sinn calf leather straps (vintage brown and black) and a Sinn strap changing tool. 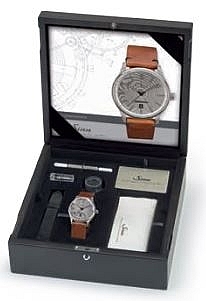 Other items include spare spring bars, an Eschenbach watchmaker's loupe, Sinn polishing cloth, warranty card and watch brochure.